Our Lumenis IPL Quantium is CE & FDA approved with an effective cooling system to deliver a comfortable and safe treatment. IPL is a light based treatment that is not only used for hair removal but also used for skin rejuvenation to target particular skin issues and correct them. The main three conditions are; Pigmentation, Redness, & Acne. Pigmentation: is formed by a change in the colour of a person’s skin due to over production of melanocytes, this dark pigment is known as melanin. 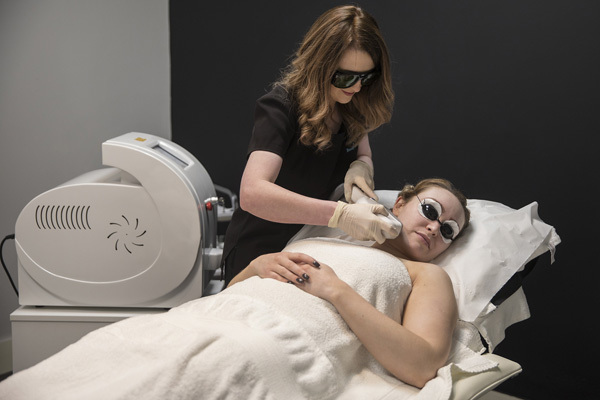 IPL light attracts to the melanin (colour) in the area and a heat reaction occurs breaking the melanin down to produce a photo toxin reaction which turns the excess melanin darker. This presents in a light crusty, dirty skin for 3-5 days and then fades and flakes off. Redness: IPL treats the following; facial couperous, broken facial, truncal, neck and chest telagiectasia, spider veins and rosacea. IPL light targets oxy-haemoglobin in the blood and a heat reaction occurs. This coagulates the blood in the area and destroys the walls of the vessel naturally removing the debris through the body. Acne: IPL only works on superficial acne treating those red, aching, raised pimples. It benefits inflammatory acne or clients with permanent acne the best. It treats the reduction of breakouts but does not stop them, aids with oil production, it closes pores by flushing out the area and cleanses off the dead skin cells, it has anti-bacterial effect, works on reducing the redness and stimulates collagen production to aid in the healing of the skin. A 20 minute Consultation and a Patch Test is required before any treatment is preformed. Here we will discuss with you if you are a suitable candidate for the treatment, making sure you have no medical history that can prohibit you from having the treatment done, we will explain how the treatment works and the do’s and do not’s of skin rejuvenation. A patch test is then given to the area being treated. Please do not have any product/tan on the area being treated when coming in for your consultation and patch test. Once you are suitable to have the treatment done and the patch test was successful, you can start your treatments, a course of 3 treatments (For optimum results of collagen stimulation, we recommend a course of 6) is required over weekly intervals depending on the skin issue been treated. When coming in for your treatment, please do not have any products on the skin. You will then been given CE approved goggles which must be worn throughout your entire treatment until your therapist tells you to can take them off. When the treatment is completed your therapist will apply soothing gel and a sun protection factor 30 to the area and give you your aftercare advice for you to follow when you leave the clinic. The Do’s & Do Not’s……. Avoid the sun 4-6 weeks before and after treatment. If have or had a history of cold sores, zovirax may be used prior to treatment and continued one week after treatment. TANNED SKIN CANNOT BE TREATED! If treated, you may get hypopigmentation (white spots) and this may not clear for 2-3 months or more. Also, the use of tanning cream must be discontinued two weeks before treatment. Please do not have any perfume, moisturizer or any products on the area to be treated on the day of your treatment. Do not use anti-inflammatories e.g. ibuprofen & aspirin for 7 days prior to treatment. No smoking 4 hours prior to treatment for the treatment of facial thread veins. Immediately after treatment, there may be redness and swelling, and mild tenderness at the treatment area, this may feel like mild sunburn. This can last 2-3 hours up to 2-3 days. The application of iced water during the first few hours after treatment will reduce any discomfort. The application of aloe vera gel can continue at home. Make up may be used immediately after the treatment unless there is epidermal blistering. Avoid sun exposure to reduce the chance of hyperpigmentation or darker pigmentation. Use sunscreen SPF30 or greater at all times throughout the course of treatment. Avoid picking or scratching the treated skin. Avoid hot baths and heat treatments and treat the skin gently, as if you had sunburn for the first 24 hours. Do not apply tanning products, perfumed products or aftershave to the area. For the treatment of pigmentation, the area will turn darker after the treatment with a light crust developing, and will fade off in the next 7-10 days. Application of aloe vera for 24-48 hours will help reduce this side effect. For the treatment of thread veins, be careful with blowing nose, facial scrubs and hay-fever after the treatment. Copyright © 3D Lipo and Skincare 2013.